I hate to see food go to waste, so my heart sinks whenever I see a bunch of bananas start to freckle before we’ve had a chance to finish it. But they’re best for banana bread when ripe and freckled. There were 4 in the fruit basket today, and 2 kids whom I knew would be hungry for a tea-time snack after school. 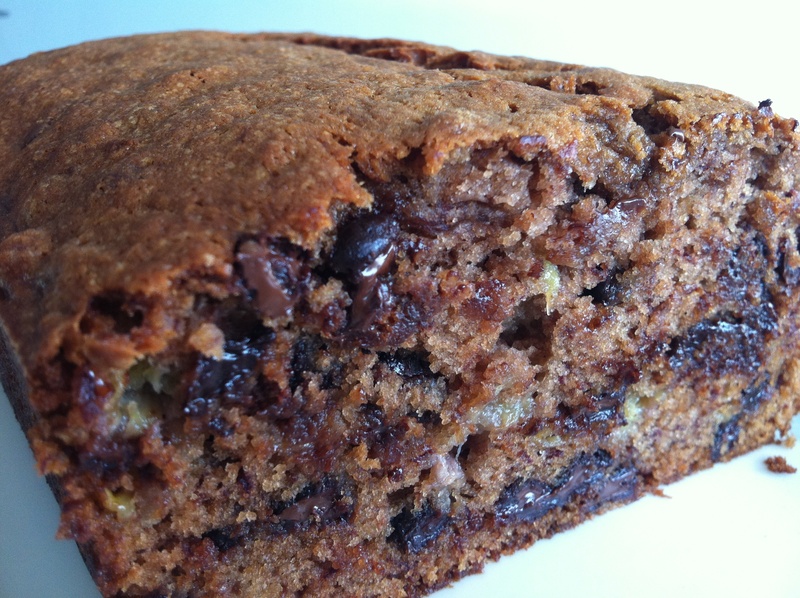 So I added a dollop of Nutella and a heap of semi-sweet chocolate chips to a simple banana bread recipe, and it came out gorgeous! Preheat oven to 155C. Mash the bananas in a bowl. Add all the other ingredients and mix well. Bake in a buttered loaf pan for 1 hour. Allow to cool somewhat, then slice and enjoy! SingTel recently brought into town Chef Gordon Ramsay to pit his culinary skill against three of our local hawkers. The SingTel Hawker Challenge, as it was named, was clearly a publicity exercise to boost the image of local hawkers and our street food in general. Three hawker dishes and the “hawker heroes” behind them were selected through a public vote. They included Chicken Rice, Laksa and Chilli Crab. I was surprised that Char Kway Teow did not make it to the list. 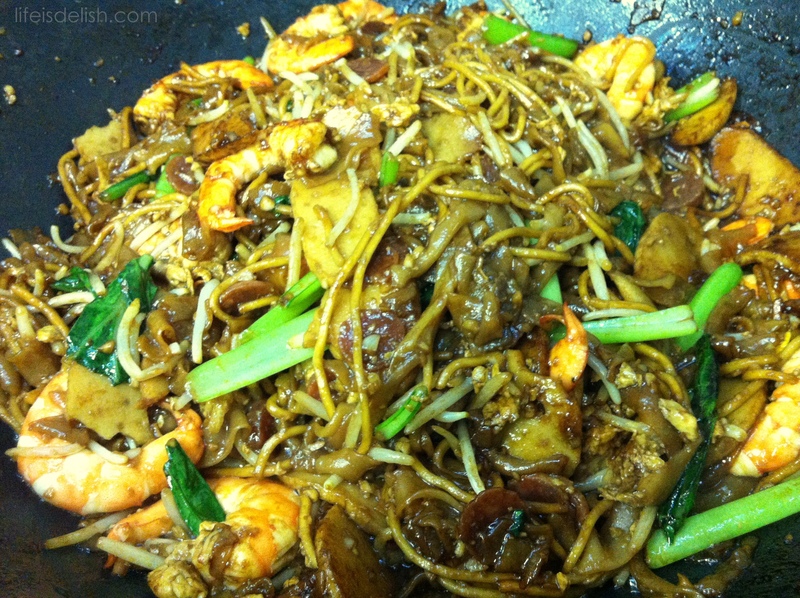 Char Kway Teow is a dish of flat rice noodle wok-fried over high heat in sweet dark sauce, with other ingredients including beansprouts, eggs, prawn, Chinese sausage, fish cake and cockles. I realise that various versions of fried rice noodle are available in other parts of Asia (such as paad thai from Thailand or the Malaysian version of fried kway teow), but the Singapore version is different because it includes some yellow noodle, which gives it a little more bite. 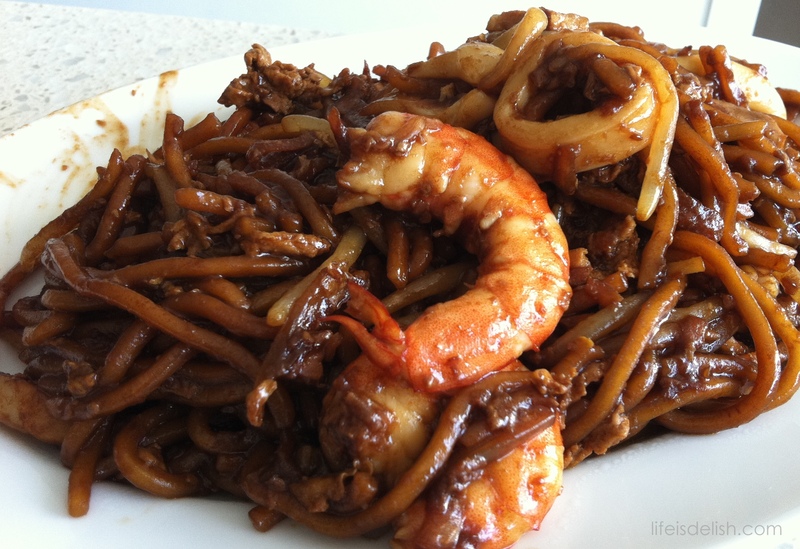 This dish, like Fried Hokkien Prawn Noodle, is unique to Singapore and very popular among Singaporeans. Either this or Hokkien Prawn Noodle ought to have been included in the list. They are among the dishes which Singaporeans overseas dream of while away, and feel the need to get their fix of, when they come home. So anyway, after each Hawker Hero had given Chef Ramsay a tutorial on how they prepared their dish, he was required to come up with his own version for the final challenge. Not surprisingly, our hawker heroes won the challenge 2-1, with Chef Ramsay winning the Chilli Crab round. Well, I don’t even consider Chilli Crab to be one of our street-foods. To begin with, crabs cost way too much to qualify as main-stream hawker fare, and it’s not even something commonly available at hawker centres. But that is hardly the point, I guess. The whole event was set up for the sake of publicity and I believe it was a success in that respect. Since I’m in the mood to ramble this lazy overcast Sunday afternoon, do bear with me as I go off on a tangent (or two, or three). I haven’t blogged in such a long time anyway, which I attribute to the new(ish) job. Since returning to the private sector and a faster-paced work environment, I’ve just not been as zen as I’d been during the 3 years before, and hence I haven’t had the inclination to measure quantities for my recipes and then sit down and write about them. I just go into the kitchen, peel, chop, slice, fry, stir, toss, taste, clang about and what-not, then enjoy the meal and crash. I’ve done a bit of baking from time to time, but entertaining on weekends or holidays have tended to be simpler affairs. What I was going to say (and this is completely irrelevant to Char Kway Teow) was that the H and I had the privilege of dining at Restaurant Gordon Ramsay earlier this year. We were in London for the London Marathon. He was running it. I was there as one-woman cheer-leading squad and crew (having been enticed by the promise that my efforts would be rewarded with a trip to Tuscany the following week). The Marathon was an experience in itself – I was awed by the organisation and the atmosphere. The races I run in our little sunny island are nothing like that, and to say it was all very inspiring would be an understatement. Now, back to Restaurant Gordon Ramsay (I did warn you there’d be many digressions), aside from the food, what really impressed me about it was the precision with which the restaurant floor was run. Really something for all restaurants to aspire to. And we even got to visit the kitchen after our meal, and received a nod and smile from Chef Clare Smyth! One day in June this year, I needed to clear out of my fridge some unused ingredients which had been originally prepared for the Fried Hokkien Prawn Noodles I’d cooked for a lunch with friends over the weekend. I started with some cooking oil and chopped garlic in the wok on high heat, then threw in yellow noodles, bean sprouts, eggs, Chinese sausage and squid, tossed it all about, followed by drizzling in from the sides of the wok dark soya sauce and sweet dark sauce, and some prawn stock. Thus was born in my kitchen, fried noodles done Char Kway Teow-style. It turned out pretty good. An old classmate CL, who now lives in Germany with her family, asked me for the recipe when she saw a picture of the dish which I’d posted. 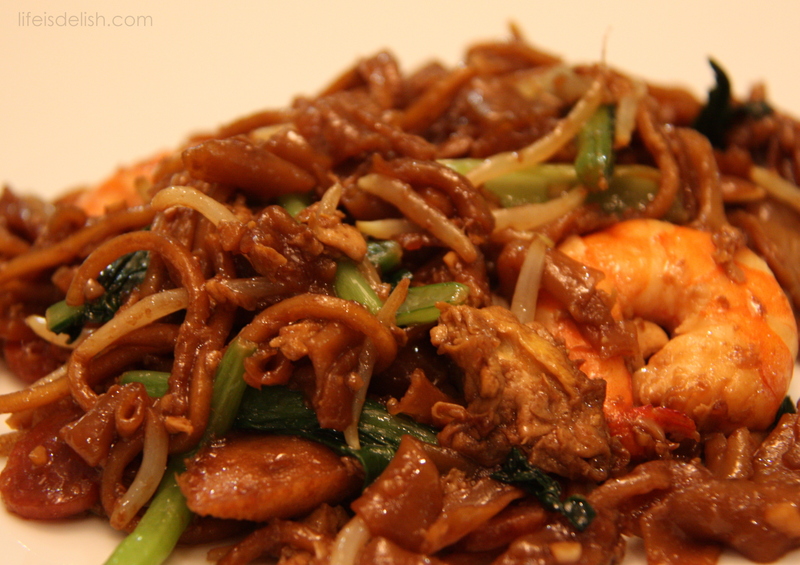 I decided I’d make a proper Char Kway Teow, actually using kway teow and some yellow noodle, before posting a recipe. So finally I got down to doing that a couple of weeks ago. I really enjoy frying up these hawker dishes in a wok at high heat (cze char style). Usually the stove-top looks like it’s been through a tornado after I’m done cooking because the whole exercise involves a lot of vigorous tossing and all which results in much spillage. Yes, it does make a bit of a mess. But it’s such fun to do! I’m sharing the recipe here, for those who are interested, and especially for CL. The quantities are estimates and based on taste, so do experiment, do some taste-testing and make adjustments as you go along. I didn’t have any cockles, which was a real pity, but if you do have some cockles (which you would’ve no doubt had to rinse like 100 times in order to get them clean), just put put them into the wok after everything is cooked and cover momentarily with the piping-hot noodles right before serving. Heat a few tbs cooking oil in a wok over medium-high heat. Add chopped garlic and stir-fry for a minute or so, then add yellow noodle, turn up heat to high and toss until coated evenly in oil. 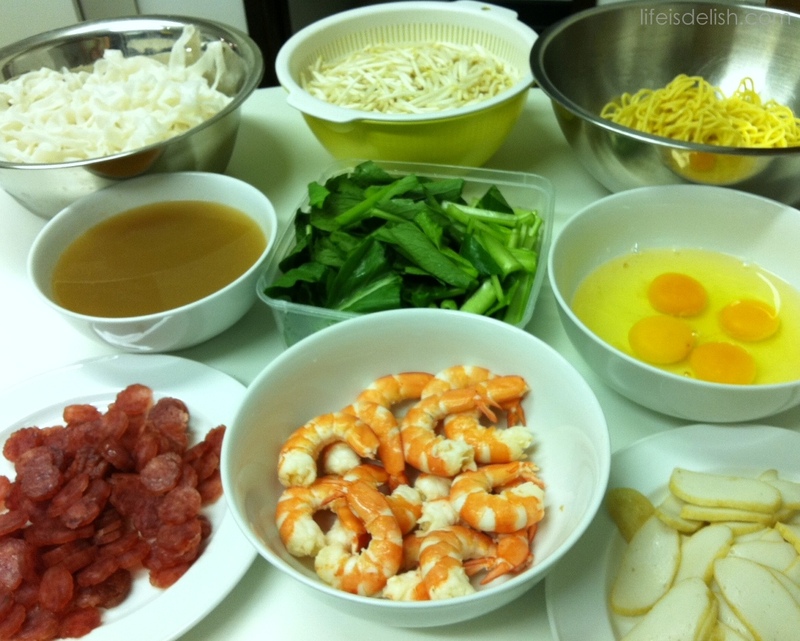 Add kway teow, and toss, mixing with yellow noodle. Add a little prawn stock. Add beansprouts, chye sim, Chinese sausage, and fish cake, then toss together with noodle to cook, and push all contents of wok to a side. Add a little oil onto the space created, allow to heat for a while, and add eggs and stir them as you would when making scrambled eggs. When eggs are half-cooked, toss the other ingredients over them so the eggs are buried. Leave for about half a minute or less, then start to stir and mix everything together. Eggs should resemble scrambled eggs, bits of which should adhere to the noodles and other ingredients somewhat. Add about 2-3 tbs dark soya to the wok by drizzling it down the sides of the wok, followed by a few tbs of sweet sauce and more prawn stock. Mix well with noodles and other ingredients. Add the cooked prawns and toss. Then serve hot. It still amazes me that it’s the new year. In the last 3 months, I’ve been occupied with training our new helper (housekeeper/cook), a very disruptive period of construction rectification work at home, the school holidays, a short birthday getaway with the family to Thailand, my first mission trip to Cambodia with some kids from church, year-end work at the office, Christmas preparations, cooking and celebrations, and then preparations for the new school year. We’re just starting to resume a more normal routine, with the kids’ new schedules finally in place, and I’m just starting on a renewed exercise regime, with my first half marathon for this year lined up for end March. And then it just hit me yesterday that Chinese New Year is only 2 weeks away! It’s usual for me to do some reflection at the end of every year, but this time round, I felt there wasn’t anything meaningful I had to say about the past year, nor were there any insights about myself or life in general which were worth sharing or even thinking about. Much of this had to do with a spiritual emptiness I’d been experiencing for awhile, stemming either from doing generally too much (or perhaps too little of any real significance), but mostly from failing to take time to spend in quiet reflection and meditation on a more regular basis. So I’ve resolved that it shall be different this year. Anyway, over the weekend, we had the enviable task of clearing out the freezer of the last of the lamb racks from our Christmas stash. I cut it up into lamb chops, trimmed off all but a very thin sliver of fat, covered the chops with a mixture of chopped garlic (2-3 tbs), dried mint leaves (1tsp), ground cumin (2 tsp), ground turmeric (1 tsp) and salt (1 tsp), let it stand for about an hour, then arranged them on a cast iron grillpan, which was then placed on the top rack of the oven to grill until cooked to medium (about 12-15 minutes). Easy and yummy. In fact, I couldn’t believe how easy it was, particularly because there wasn’t much cleaning up to do. If you’ve ever had to clean up your kitchen after cooking on a grillpan over the stove, you’ll probably know what I mean. 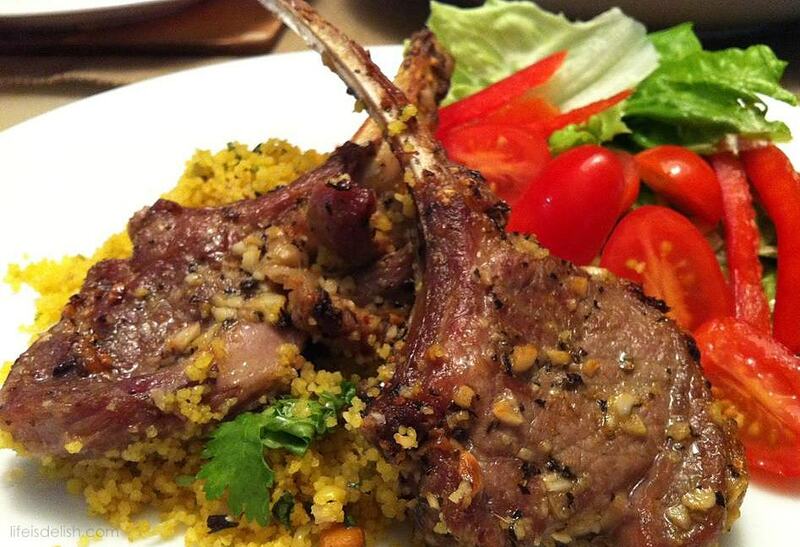 We had the lamb chops with saffron-spiced couscous. I’d sauteed some chopped garlic (2 tbs) and sliced shallots (3 tbs) in olive oil in a pan until softened, added some ground turmeric and ground cumin, and mixed it with the garlic and shallots and continued to saute for awhile. Then I added into the pan 3/4 cups water in which I’d soaked a pinch of saffron threads, and brought the pan to a boil. I then added 3/4 cups couscous and some salt, stirred with a fork, covered the pan and turned off the heat. In the meantime, I toasted some pinenuts in the oven-toaster (about 5 minutes). Then I turned on the heat on the stove back on to low, fluffed the couscous with a fork, added some softened butter (about 1 tbs or so), and salt to taste before turning off the heat. Finally I tossed some chopped coriander and the toasted pinenuts before serving. Well, if you ever try this out, I hope it works for you as well as it did for us. I consider this a fuss-free lamb chop recipe, because it entails so little preparation, and doesn’t stink up your whole kitchen. And that is always a good thing. Have a good week! 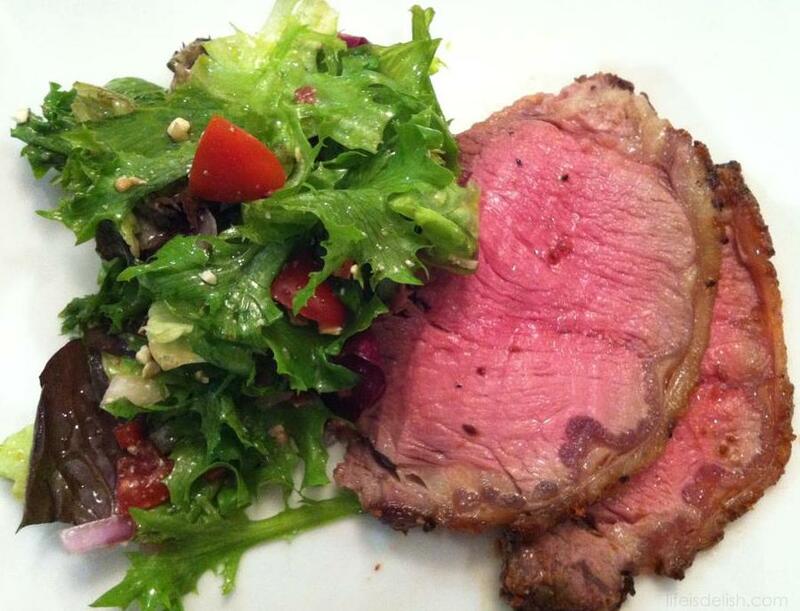 Black Pepper and Garlic Striploin Roast. Nice, charred and smokey. So yummy. Coated in a mixture of minced garlic and coarsely-ground black pepper, and roasted in the oven at 235C for 50 mins for a perfect medium rare in the middle and medium at the ends. Hello! Although I haven’t been blogging here much, I’ve continued to regularly share pictures from my kitchen on my facebook page, Life is Delish by tsa. Like the one in this post, which was from one of the Christmas dinners we hosted. Here is where I make the longer posts and share recipes (when I have time to sit down in front of the computer! ), otherwise, I’m usually just posting on my facebook page. That’s actually where this blog originated – I started this blog because friends who liked my food pictures on facebook were often requesting that I share my recipes, so I decided to blog them. (Edited on 7 November 2012. Revisions italicized). I enjoy cooking for many reasons. One of them is that at times, it’s almost a form of escape, and it helps keep me relaxed and balanced. During those times, I am focused completely on preparing the meal, and when it’s done and the meal has been enjoyed, I feel refreshed, almost energized. This was tonight’s dinner, and what a delicious, hearty and healthy meal it was! So easy to make too, thanks to that dutch oven which I’m appreciating more and more. We had this Chicken Casserole with quinoa, which I discovered today that I really enjoy. No wonder it seemed to be everywhere in the US – quinoa, that is. Anyway, to make this, first chop up whatever sweet vegetables you like (the juicier the vegetables the better) into bite sizes. (I used 2 potatoes, 2 carrots, 2 onions, 3 stalks celery and even threw in 2 apples. I will try it with corn kernel next time). Then cut up a whole chicken into 6 parts, pat dry with paper towel and rub with 2 tsp salt and 1/2 tsp sugar. Now put some olive oil into a casserole over a stove and saute a garlic (separated into segments with last layer of skin on) and the onions, then the chicken, until chicken is browned. 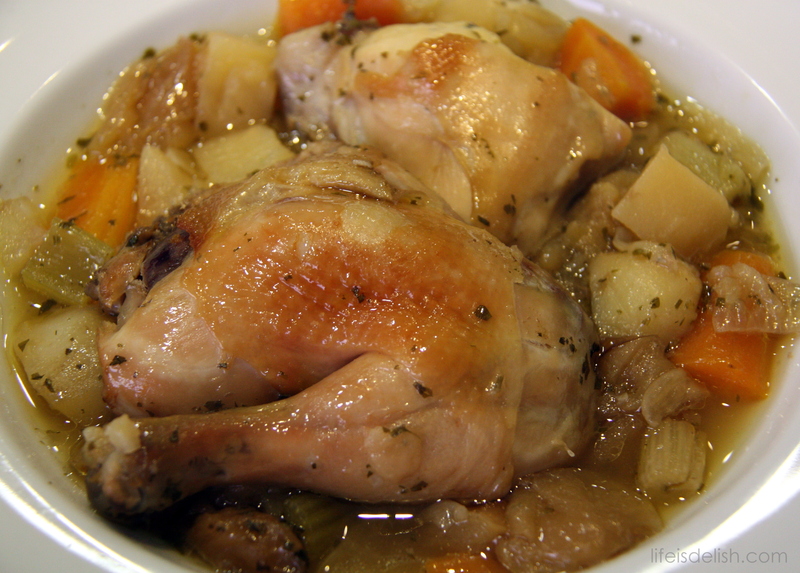 Remove chicken from casserole. Chuck all other vegetables into the casserole, toss in some chopped Italian parsley or thyme (or both) and allow to stand on low heat on stovetop for a couple of minutes. Some moisture from the vegetables should have collected at the bottom of the casserole. Then arrange chicken back on top, skin side up. Cover casserole and put in preheated oven at 160C 150C for 2.5 hours (during which time you can do a whole host of other things!) What is produced is juicy, tender, flavourful chicken, and its drippings and the moisture from the veggies make a wonderful broth even though no water was added at all. Sprinkle salt and pepper over and serve. 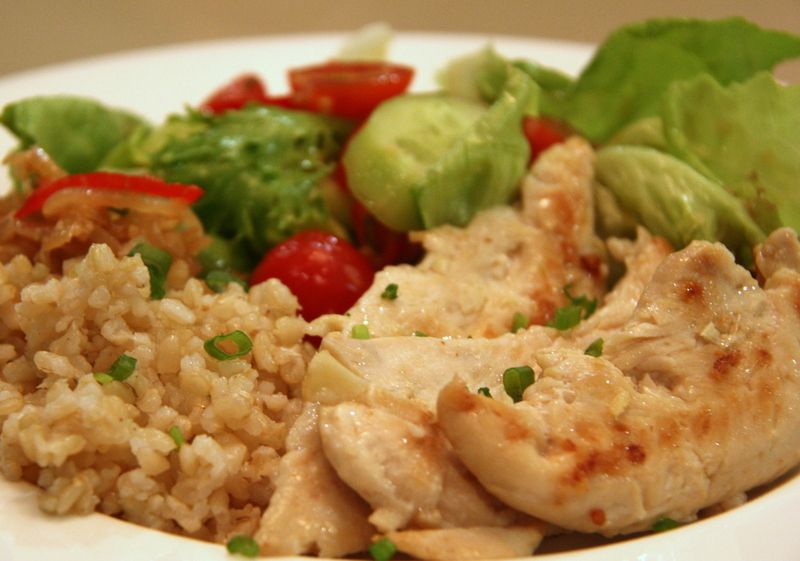 As part of an effort to include healthier meals into our home menu, I made an Asian-flavoured Grilled Chicken with Brown Rice and Salad for dinner over the weekend. We don’t usually eat brown rice at home, but I’m hoping to introduce some complex carbohydrates and grain into our regular diet. Brown rice is rice with only the hull removed (as opposed to white rice, which has hull and all its nutrients removed in the refinement process). Brown rice contains vitamins, minerals and fibre, is cholesterol-free, low in calories, is a good source of energy and helps in fat-burning. How did I get them to eat it? Of course I cheated. The rice was cooked in home-made chicken stock with garlic and ginger, to ensure it went down well with everyone. And it worked so well that I was told it would be alright if we converted to brown rice for good! For the grilled chicken, I used chicken fillets which were marinated with bashed garlic, sliced red onion, sliced ginger and (just because I happened to have 2 stalks of lemon grass in my fridge) 2 stalks of lemon grass chopped (tender white parts only). Just a little salt was added, then it was left to marinade for a bit before grilling/ pan-frying with a minimal amount of olive oil on low-medium heat till just cooked through, so it remained tender and juicy. What I was particularly proud of about this meal was the salad. Or the salad dressing, to be exact. It was a zesty home-made dressing I’d originally come up with some time back to make an Asian-flavoured chicken salad. Its flavour is very similar to that of the yu sheng (raw fish tossed in a vegetable salad) we get from rice porridge (chok) stalls at hawker centres. What goes into the salad dressing is approximately 1 tbs sliced shallots (or substitute with chopped red onion, although not ideal), 2 tbs finely-minced ginger, some chopped spring onion, 1.5 tbs of sesame oil, 1.5 tbs light soya sauce, half a chilli sliced, and the juice of 2-3 medium-sized limes (add more if preferred), all whisked together till well-blended. Do adjust the quantities of the ingredients shown here to taste, as they are rough approximates. Tossed with mixed salad leaves, sliced cucumbers and cherry tomatoes, this makes a very refreshing salad, especially when eaten chilled. It’s the rainy season again, which means hot humid afternoons followed by thunderstorms in the evenings and early mornings. But today, I’m secretly (or not so secretly) pleased that the dark clouds have given me an excuse not to go out for a run. Because I’ve neglected blogging for long enough, and I do miss it. I mentioned we were getting a new housekeeper/cook. Now, I miss the luxury of having things in the kitchen done with minimal supervision, but I’m not complaining, since it’s all part and parcel of training someone new. Today I just wanted a simple one-dish meal, so I took the opportunity to demonstrate how I like Fried Rice to be cooked. Fried Rice may be considered one of those basic dishes which any Chinese home-cook can make. When I first started cooking, I was arrogant enough to believe that I’d be able to make fried rice quite easily. But it took me a couple of attempts before I got it the way I wanted – with the rice grains “loose” instead of mushy or clumping together, and the egg adhering to the rice grains and remaining somewhat fluffy. A lot of it boils down to practice. The more comfortable you are with cooking with a wok, the easier it becomes. In a wok, heat about 4 tbs oil, then fry garlic, ginger, shallots and onion till fragrant. In order not to brown or burn any of it (esp the garlic), adjust the heat down as may be necessary. Add pork and fry till browned, then add prawns, and vegetables and stir fry everything until cooked. Remove from wok and set aside (the wok should be dry). Fry cooked rice in the same wok, tossing and pressing the rice grains against the wok to separate them, until all the rice grains have come loose from one another. Return the rest of the cooked ingredients into the wok and toss together with the rice until well-combined. If there is liquid in the cooked ingredients, don’t add it to the rice all at once, as it could become too wet and mushy. Instead, add none at first, then a little at a time until desired “wetness”. (Sometimes I don’t add any of it, especially if using a lot of brown onion which tends to produce a lot of moisture). Once the rice and other ingredients are well-combined, add soya sauce, salt and pepper to taste. Now push the fried rice to one half of the wok, so that the other half of the wok is empty. Add the eggs into the empty half of the wok, and leave for awhile to cook without stirring (as if frying an omelette) until the underside is just beginning to cook (it should no longer be liquid). Adjust the heat down if necessary so the egg does not brown. It should still be soft. Once the underside is cooked (and the upper part is still somewhat liquid), toss the rice over it and leave it for a moment so the liquid part of the egg has time to adhere to the rice as it cooks and solidifies. Once that happens, toss the rice in the wok and spread it out and turn it over in sections with the spatula if necessary, so that the parts with the egg come into contact with the wok, to enable all the bits of egg to cook. Avoid stirring too much when the egg is still in liquid form. Once all the egg is cooked, adjust seasoning if necessary. Your Fried Rice is now ready to be enjoyed. So I’m back. It seems that for the past couple of weeks, there’s always been something more compelling to do than cook. Or maybe it has to do with the impending departure of W, who’s been my very dependable sous chef for the last 5 years. Knowing I’d have to spend a lot more time in the kitchen after she leaves (in training someone new to take her place) may have caused me to subconsciously make other things a priority for now. Anyway, today I got up and decided that for dinner, we’d have home-cooked Roast Duck, Broccoli with Conpoy Sauce and steamed white rice. 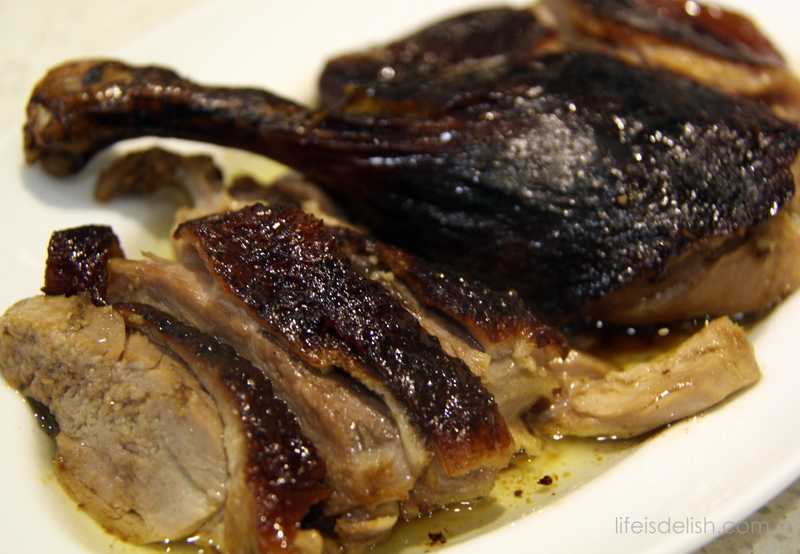 As for Chinese Roast Duck recipe, but for glaze, reduce vinegar to 1/8 cup, reduce honey to 2 tbs, and add 1 tbs hua teow chew (Chinese rice wine) (You may omit this if you don’t have it). Additional ingredient: 1 tbs butter for brushing on skin towards the end of roasting. “Butterfly” duck by removing backbone and spreading it out. You may wish to break part of the breastbone, to get the duck to spread out better. Pat dry duck with paper towels and rub dry marinade all over and under skin, as well as on the underside. Place aromatics on a baking tray, place duck on top with skin side up, covering the aromatics. Pat the duck skin dry with paper towels. Place baking tray in oven preheated to 220C in middle rack. Place another tray in lower rack with 1-2 inches depth of water. Roast duck for 15 minutes at 220C. Meantime, put glaze ingredients in small saucepan and bring to boil then remove from heat. After 15 mins of roasting, brush on glaze. Return to oven to roast at 200C for 20 minutes, then glaze again. Reduce temperature to 150C and continue roasting for 35 mins. Remove from oven and brush some butter over the skin. You may also baste with the fat which has rendered from the duck which is now in the baking tray. Now turn up temperature to 220C and roast for 15 minutes more to get skin crackly. Remove from oven and allow to stand for at least 15 minutes before chopping it up and serving. I don’t remember how or when it all started, but we’ve been celebrating National Day at my parents’ place for years. We all show up in red and white, watch the Parade on tv, and have dinner. It’s something we look forward to. For a long time, we did barbeque. But of late, we’ve had steamboat-barbeque or just steamboat, and this year, a red-and-white potluck. Mom had said she would prepare crab. That’s always good news because she gets really good live crab which she slaughters at home on her own before cooking. It’s all rather heroic. I’ve never even bought live crab, let alone try to slaughter one myself. I’ve only ever cooked the frozen kind, all cleaned and shelled. She bought 8 crabs this time round. Yes, 8! She does spoil us. Anyway, she suggested I make a red-and-white fried bee hoon and some char siew, and I was happy to oblige. Between the parents and my sister’s family, there was also prawn and baked cod. To be honest, I stopped paying much attention to the Parade on tv some years back, only stopping to actually watch when it came to the National Pledge and Anthem, and maybe the finale. But I have to say it’s usually quite spectacular, especially the fireworks display. Against the backdrop of our beautiful night-time city skyline, it’s enough to bring tears of national pride to one’s eyes. Check out this album by Cam Rolling Studio for some photographs. I know of some Singaporeans who love not just watching the Parade live at the venue, but being a part of it as well. On my part, I just realised I’ve never once watched it live, and I think it’s time to change that. Now I just have to figure out how to get myself some tickets for next year’s. We just celebrated our 12th Wedding Anniversary last weekend. It amazes many people, but the H and I have actually been together for 22 years. Definitely something to give thanks for. But of course I was practically a child bride. We were having a quiet dinner out without the kids. I had just popped a most luscious piece of otoro sushi into my mouth when the kids called in a panic to say the neighbour’s house was on fire. So while they were being evacuated by firemen, we thanked our sushi chef and explained that we had to go. Thank God everyone was safe and the fire was contained. I didn’t get to taste much of that otoro, but a most memorable dinner date it turned out to be. Anyway, the H loves paella, so yesterday I decided to give it a go. Call me old fashioned, but I like the idea of cooking for my man. Actually, that’s what started me cooking in the first place. But that’s another story for another time. Now, I decided on Seafood Paella, so off I went in the afternoon to pick up some mussels, squid and tiger prawns. And while I was at the supermarket, I decided to throw in some chorizo as well. I couldn’t find any paella rice, so I just got some medium-grain rice. The rice took a lot longer to cook than I’d expected. In fact, halfway through, I actually wondered if it would ever get cooked. But the family survived the wait, it turned out pretty good and people were happy. Kind of scraping the bottom of the pan at the end of it. Not bad for a first try at all. So although I’d been a little moody all day because I missed my Saturday morning run, it made me feel a little better. Here’s my recipe, which I hope you’ll like. I didn’t use any chilli or anything spicy (other than the chorizo). Heat olive oil in pan. Remove skins from chorizo, and break up into balls then cook over medium-high heat. (Alternatively, you could just saute them till half-cooked, slice them with skin on, then return to pan to cook till nicely browned). Remove from pan. Saute squid till just cooked and remove from pan. Saute garlic, onion and tomatoes until softened and add the saffron with the soaking water. Continue to cook until all the veggies are mushy. Add 2 cups prawn stock and 2 cups chicken stock, bring to boil, season with salt and pepper, then add the rice and simmer till cooked. Add stock if it turns dry before the rice is cooked. (I covered the pan only after half an hour, so it took more than an hour for the rice to cook). When rice is almost cooked, arrange the squid, prawns and bell peppers on top of the rice, and cover. (I actually roasted the bell peppers beforehand, and tossed it in after the rice was cooked – you could do this if you don’t mind having to roast them). In a separate pot, steam the mussels till they open (discard those which don’t). Once everything in the pan is cooked (I had to turn the prawns over once), place the mussels on top of it, and serve.